Theme: Solve multi-step real-life and mathematical problems posed with positive and negative rational numbers in any form (whole numbers, fractions, and decimals), using tools strategically. Apply properties of operations to calculate with numbers in any form; convert between forms as appropriate; and assess the reasonableness of answers using mental computation and estimation strategies. For example: If a woman making $25 an hour gets a 10% raise, she will make an additional 1/10 of her salary an hour, or $2.50, for a new salary of $27.50. If you want to place a towel bar 9 3/4 inches long in the center of a door that is 27 1/2 inches wide, you will need to place the bar about 9 inches from each edge; this estimate can be used as a check on the exact computation. Gary is balancing his checking account with his spending. His checking account shows a balance of $750.83. He has accounted for all of the deposits and purchases he has made except for one transaction. He cannot remember the exact cost of a pen set he purchased as a gift for a number of friends. He also can not remember exactly how many of the sets he purchased. Not including that purchase, he has calculated that his account balance should be $855.83. Using rational numbers for n and p, write an expression in the form of: Balance + (n)(–p) to represent one possible scenario for the number of pen sets purchased, n, and the price of each set, p. Explain why this form of the expression makes sense and why the numbers you have chosen for n and p make sense in this scenario. Write your answer in the box below. 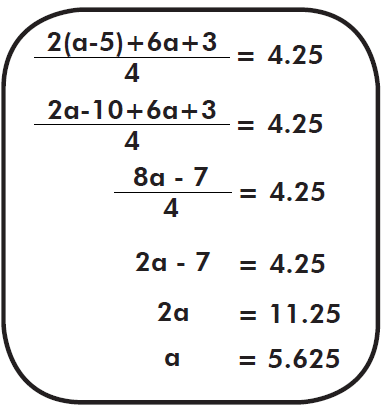 Theme: Apply and extend previous understandings of addition and subtraction to add and subtract rational numbers; represent addition and subtraction on a horizontal or vertical number line diagram.